17 million tickets were sold for last Friday’s $15 million Mega Millions draw! That’s a lot of people playing, considering the jackpot will take some time to get close to its former glorious jackpot sum. Out of the 17 million lotto tickets purchased, not one matched the five main numbers and the Mega Ball – not even just the five mail numbers. The jackpot got a $5 million increase accordingly, and is now worth $20 million for the next round on Tuesday. The winning numbers for Friday, November 7th were: 31, 35, 41, 65, 66 and Mega Ball 5. Over $2 million were distributed among Friday’s winners, regardless of the no-jackpot winner and no second prize winner. Winners of the previous round that ended with the colossal $321 million jackpot are now starting to appear, and one in particular caught our eye this week. 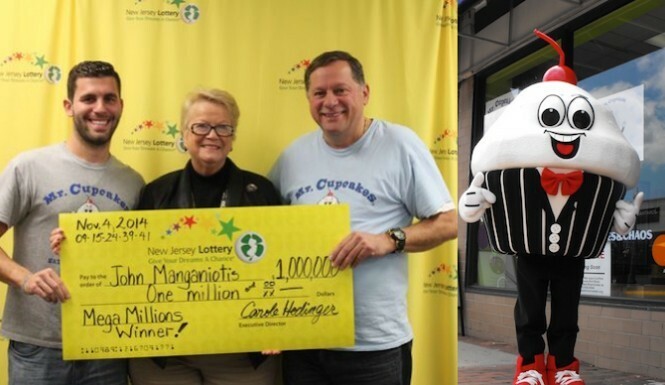 The 57 year old John Manganiotis from New Jersey took a spin on a lottery winners’ tradition to disguise their identity and came dressed up as Mr. Cupcake – the mascot of his son’s bakery. While the father and son duo was out running errands on Monday, November 3rd, father Manganiotis decided to spend some money on a Mega Millions lotto ticket. The two didn’t waste another thought on it until Wednesday, when son Johnny read about the amazing $326 million win (an extra $5 million was added to the estimated $321 jackpot thanks to booming tickets sales) in a local newspaper. That article also mentioned a second prize winning ticket that was purchased in the same liquor store where his dad had bought his ticket. When checking the ticket, father and son realized they had matched the five main numbers. The father was stunned when his son explained to him he just won $1 million! $720,000 after taxes goes a long way in the cupcake world, but the ‘Cupcake family&rsquo’ plans to give some of their new found fortune to charity first – a commendable decision we applaud with respect! If you play your numbers right this Tuesday, you could be the next guy to dress up in a funny costume to collect your lotto millions! Aussies don’t have a problem dressing up, right? Make sure you check the Megaplier box, so any secondary win you take will be multiplied – potentially up to 5 times, depending on the Megaplier number drawn! Australian lottery fans: you can play US Mega Millions online! We want to emphasize the fact that playing the Mega Millions lottery is not an exclusive right of those who live in the USA! You can play from anywhere in the world, including from your beloved Australia! So what’s stopping you? Take a shot at winning some of the biggest lottery prizes the lottery world has to offer! As one of Australia’s rock icons would say it (or so we imagine): for those about to play Mega Millions – we salute you!